If your fleet is in the over-the-road trucking business, there’s a good chance you’re feeling a lot of pressure right now. Your margins are already thin and new economic factors and governmental regulations are threatening profitability. As reported in a recent Fleet Owner article, shippers and third-party logistics providers are working together to drive freight rates down. On top of that, equipment prices are rising and, with the driver and technician shortages, you might have to consider wage increases and other incentives to retain your staff. There’s no doubt about it: Your fleet is facing incredible challenges. It’s likely that some fleets will fold under these pressures. So if you’re able to survive, you might find yourself in a position of incredible opportunity. Are you spending too much on rentals and safety stock? If so, you have an excessive downtime problem. Take a step-by-step approach to eliminate the root causes, which may include poor communication across your fleet and with third-party providers. Is your staff spending too much time on data entry? Manual data processes are a waste of time and money. One Florida-based fleet saved $60,000 per year by transitioning to an automated data capture system. Is your in-house maintenance shop less efficient than it used to be? With truck technology getting more complex, trucks require more specialized skills and tools to service and fix. This problem is exacerbated further by the truck technician shortage. Your shop is losing the resources it needs to fix trucks quickly, and trucks are lingering longer in your repair bay. Are truck breakdowns draining your profits? Truck breakdowns happening too frequently will greatly impact your fleet financially. If this is happening to you, it’s likely that your current approach to inspections and preventive maintenance isn’t sufficient. Are you handling fleet maintenance management the same way you were 20 years ago? Relying on the same old approach to fleet maintenance is a recipe for failure. Look around your maintenance office. Are you storing asset histories in file cabinets? Is the “latest technology” a fax machine? If so, it’s time to upgrade. There’s a tremendous hidden upside to the pressures currently affecting the trucking industry. While regulatory pressures will almost certainly remain, the overabundance of capacity that’s forcing prices down is predicted to go away. In fact, analysts are forecasting that “the mother of all capacity shortages” could hit as soon as 2017. If current pressures put some fleets out of business, this shortage is sure to be even worse. If you’re able to improve your fleet maintenance management processes and survive the current economic pressures, when the shortage hits, the capacity in your trucks will be a more valuable commodity than it’s ever been. This means you’ll be able to set rates that are competitive and that increase your margins. The opportunity is on the horizon, as long as you’re able to hang in there for the short term and prepare for future opportunities. Are shippers and 3PLs currently forcing your rates down? 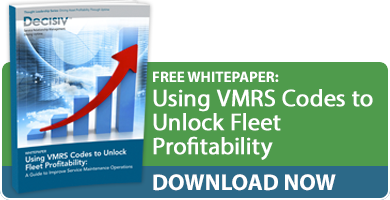 Are you leveraging technology to turn fleet maintenance into a strategic advantage? Please share your thoughts by posting a comment below.